Following a long workout, sushi is one of those dinner options that helps you maintain at least the appearance of being "healthy". You even feel smarter just contemplating which rolls and wraps and Nigiri you're about to consume. Seafood plus rice plus sauce has got to be good for you, right? After two weeks of talking up his favorite sushi spot, and an upper body workout that'd leave me sore for three days, Joe decided it was time for me to see what Trapper's Sushi had to offer. One look at the menu and it was easy to see the main thing Trapper's has going for it: the accessibility of its menu. Things like shrimp tempura didn't appear to show up with tails or heads and of their 45 eight-piece long rolls, nearly one-third have crab. Despite over half of their long rolls incorporating a "spicy" ingredient, for folks who are connoisseurs of spicy, you'll need to ask for more Sriracha. Again, think accessible. By the time we'd polished off the starter bowl of edamame (which I wish had been steamed a few minutes longer), the first of our long rolls had arrived. The Trapper combined a roll of tempura Crystal shrimp wrapped with seaweed and rice that's then covered with spicy cooked scallops, green onions, and tobiko in a spicy mayo dressing like a chilled "salad". The warm, crispy shrimp paired nicely with the chilled scallops. All of the flavors were mild, despite having "spicy" as an ingredient, and the textures were crispy and creamy, with little pops from the tobiko. The scallop texture was just right. This was definitely our favorite roll of the evening. The second roll that arrived was the Willis. The long roll featured spicy crab, green onion, and cucumber all rolled in tempura crumbs. The top also had two sauces: a sweet, red-brown sauce (tasted exactly like the bottled Mae Ploy Sweet Chili Sauce) as well as a Sriracha mayo to help add heat. The Willis was the sweetest of the three rolls, though the cilantro and mayo helped cut through the sweetness of the crab and sauce. Unfortunately, the predominant flavor was the sweet chili sauce, though there was a cilantro burst on the pieces with extra cilantro. In keeping with the "accessibility" of the sushi, the roll would easily be one most people would enjoy given the flavors were mild. Bonney Lake was the last roll Joe and I shared. Trapper's does an interesting job combining a regular rice roll with cold salads and the Bonney Lake long roll continued that tradition. There is a huge amount of spicy crab salad on top of the roll. So much, in fact, that the serving plate still had probably 20 percent of the salad on it after we had served ourselves. It almost goes without saying, but it was a very hearty roll. The salad is topped with a thick stripe of Sriracha that helps balance the sweet crab salad and sushi rice. The roll itself has tempura, Crystal shrimp, and cream cheese. If you're someone who typically orders at least three rolls for just yourself, Trapper's does offer an all-you-can-eat from their long roll, wraps, and Nigiri menu sections. The lunch special is $17.95 and dinner's just $26.95. The long rolls range between $5 and $11, so it wouldn't take much for the all-you-can-eat prices to look cheap. You will have to sit at the sushi bar in order to get the special. Also, for parents with adventurous kids, children under 10 eat free on Wednesday nights which is a great deal for budget-minded families. Overall, despite relatively mild fare, the sushi was fresh, well-prepared, and the eight-piece long rolls are a serious bargain compared with the usual six-piece higher priced sushi offered elsewhere. (For those of you who drink a lot of water with your meal like me, you'll be thrilled with the vat-sized glasses of water.) If you're off the beaten path, stop by and see why Trapper's Sushi earned 3.5 Stars. I first learned about La Fiamma when my then roommate (and long-time best friend) Chris said he was applying for a job there and casually mentioned how fantastic their pizza was. According to their website: "An immediate sensation, Dan and Ken’s restaurant was showered with acclaim, winning the Best New Business and Bellingham’s Best Pizza awards, as well as garnering two Best Recipe awards in the National Association of Pizza Operators (NAPO) International Recipe Contest." That was in 1998, and I've been a hearty fan ever since. That fanaticism has proven over the years to be the perfect companion to a Sunday afternoon and a casual, not-too-lengthy drive up to Bellingham. La Fiamma's decor is upscale with its aluminum table tops and chairs, yet accessible and feels more like a great place to hang out with your family and friends. Of course, the pizza "is not burnt - it's kissed by the flame!!" and who can resist such a charming, delicious kiss? Despite knowing for sure I was going to order pizza (well, to be honest: pizzas), and despite Dan and I taking forever to decide how to best half-and-half our options to maximize our dining pleasure, I had to start with a salad. 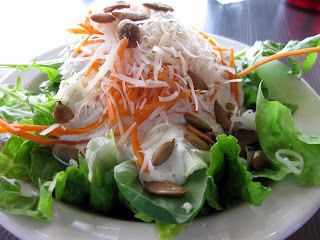 Arriving with crispy, leafy mixed greens, shaved carrots, a sprinkling of sunflower seeds, shredded mound of cheese, and a hearty saucing of an amazing house-made "Sudden Valley Ranch", the Green Salad was exactly what you'd hope for in a house salad. The side is large enough to whet your appetite, though it can be ordered in a gigantic "party size" that serves 10 if you're feeling extra generous (or greedy!). Speaking of our half-and-halfing, our first pizza combination united The Bella and Pizza Diablo. 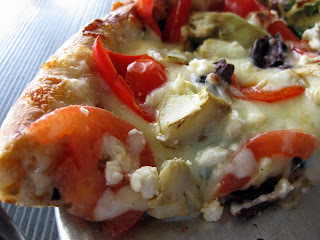 With its spicy tomato sauce, shitake and white mushrooms, green and yellow zucchini, Kalamata olives, feta and mozzarella cheeses, red onions and red peppers, and sprinkled with black sesame seeds (yes, it's practically the kitchen sink), The Bella is a veggie lover's dream. The vegetables were perfectly cooked with plenty of bite left to offer crunch atop the chewy thin-crust pizza and the sauce offered just enough kick to keep your mouth happy. 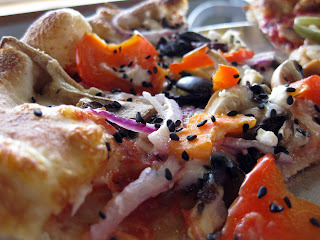 Despite all that yumm, the Pizza Diablo was no slouch either. As the name suggested, the tomato sauce was spicy, Insernios Italian link sausage was the hot variety, and the pickled cherry peppers and mozzarella were a perfect tangy and creamy pairing. This isn't the pizza for serious burn fans, but there's enough warming and a solid tickle in the back of the throat (which seems to be more heat that most can handle in the Pacific Northwest). You can always add more hot red pepper flakes if the need for true heat is calling. Our second attempt at our "taste everything possible in one sitting" affair combined the Greek Havoc and the Chicken Potato pizzas. The Greek Havoc is another of La Fiamma's vegetarian selections. It starts with their herbed white sauce and ends with red bell peppers, Roma tomatoes, grilled artichoke hearts, Kalamata olives, fresh spinach, and feta and mozzarella cheeses. At first blush, it looks similar to The Bella, but it's the sauce that keeps the flavor of these two worlds apart. 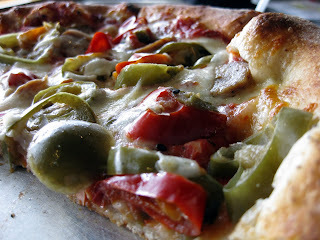 Even the vegetables on that half of the pizza seemed creamy thanks to the grilled artichoke hearts and Roma tomatoes. Bottom line: herbs + white + sauce = divine. The pizza got even better being paired with the Chicken Potato Pizza. It featured a roasted, onion-garlic potato sauce. Oh, and the smoked chicken, fire-roasted rosemary potatoes, smoked mozzarella, and balsamic vinegar syrup were hearty and unconventional. 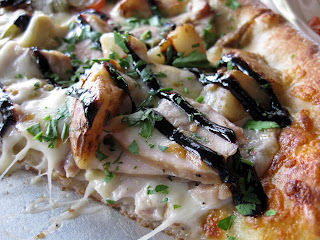 Yes, the smokey chicken and cheese made for a wonderful bite (after bite, after bite), but it was the rich, tangy balsamic syrup that really put the pizza over the top and moved it from an average pizza into a fantastic pizza. Whether it's the Wood-Fire S'more complete with caramel and Belgian chocolate or the perfect "stolen" Rosemary Lemonade recipe (you really should try that! ), La Fiamma serves continually delicious salads, pasta, and flame-kissed pizzas that should definitely be included in your next visit to Bellingham. For those of you looking for extraordinary dining at affordable prices, March is your month! This year, 28 of Seattle’s finest restaurants are participating in Dine around Seattle, including Dahlia Lounge, Barolo Ristorante, Chez Shea & Shea’s Lounge, Ponti Seafood, and Steelhead Diner (one of my personal favs). The offerings provide three-course meals for $30 and many lunches are only $15 (beverages, tax, and tip not included). All of the menus are listed by clicking on each of the restaurants at the URL above. Specifics on times, addresses, telephone numbers, and which meals each restaurant serves (e.g. lunch and/or dinner) are also provided. The $30 options typically includes an appetizer, entree, and a dessert, so this really is a "you'll be sorry if you miss it" event! You can even book your reservation directly from the Dine around Seattle website. What could be easier? If you’ve balked at trying some of these restaurants because of the price of their entrees, now’s the time to investigate some really delicious eats for a very limited time only. When one of my close friends raves about a product, service, or experience, you can practically guarantee you'll end up enjoying it as much as they did. Thankfully, Ryan, Kyle, and I were in West Seattle when Kyle suggested one of his favorite dinner and cocktails restaurants: Cafe Revo. Cafe Revo is a charming restaurant in the odd block of shops amidst the sea of condos, apartments, and homes on Avalon Way. As both Kyle and Chris had lived only blocks from there for years, I was surprised I had missed this gem (you probably did, too). Fortunately, it was a warm, sunny Seattle day and there was plenty of room on the patio for us to relax and soak up the afternoon. After our drinks arrived, we took a few minutes to peruse the somewhat limited lunch menu. One thing you won't find here is a multi-page novel that includes a laundry list of eats. What you will find are a handful of well-crafted appetizers, soups and salads, and pasta, meat, and fish entrees. If you're a relatively picky eater and it takes you a while to find exactly what you'll be ordering, this could be a blessing or a curse. I would recommend asking the waitstaff what they'd prefer as our waiter was very knowledgeable about the lunch offerings and made excellent suggestions for each of us. When Kyle said we absolutely had to order the Pane con Aglio, Cafe Revo's version of "garlic bread and marinara", we rolled our eyes and said, "Really? The garlic bread is that good?" He proceeded to remind us that he loved the restaurant, that they had incredible cocktails, and that the garlic bread was not to be missed. And he was right! The order arrived with several thick, crusty pieces of olive-studded, freshly baked bread topped with Parmesan, garlic, olive oil, parsley, and a light and savory marinara sauce for dipping. If you love carbs, or garlic, or olives, this really is an appetizer you shouldn't pass up. The crunch and slow tearing of your bite through the savory bread very nearly had us ordering seconds! For our entrees, Kyle and I both ordered a salad: Luna di Mare. The seafood salad was loaded with Dungeness crab, shrimp (albeit what appeared to be canned, cocktail shrimp), tomatoes, avocados, chunks of Gorgonzola, and dressed with a Gorgonzola vinaigrette. There were also two pieces of regular garlic bread on the side which certainly helped the overall texture of the salad. Despite the salad's generous portion, Kyle managed to finish almost all of it. Unfortunately, I think I was distracted by the Pane con Aglio because I completely forgot to ask them to hold the Gorgonzola (though I remembered to have them exchange the dressing for ranch). As a result, I had to send back my salad and find something else to order. Given Ryan's lasagna had been taunting me, I decided it would be best to just give into the temptation and order it myself. To be honest, the Saluti Tutti Lasagna is a pretty serious entree. It features a seven-layer mountain of fresh, thick pasta noodles, Parmesan cheese, Uli's famous sausage, marinara sauce, and it's topped with a creamy bechamel sauce and a heavy dusting of fresh herbage. The flavors were outstanding! The lasagna noodles are hearty but tender and provide a perfect platform for layering a ton of sausage. Ryan said the only drawback was the number of noodles and that he wished there was a bit more filling. I thought the noodles were the most unique thing about the dish and felt it helped the dish stand out as something unique to Cafe Revo. When the bill came, I was pleasantly surprised they had only charged us for one salad. Excellent service that goes above and beyond like that, especially when it was clearly my own mistake, is what makes Cafe Revo a distinctive and delicious dining destination (and earned our server a serious tip). The next time you're in West Seattle, see for yourself why the 4 Stars are deserved. It's surprising what a $240 million dollar expansion can do to a bedraggled mall: 400,000 square feet of new and shiny, 75 new specialty shops, and seven new restaurants ("real" ones, not just food court noshes). According to Joey's website, "It's a lively place where we've used the rocket science of acoustic design to let you sit at the centre of the action and still enjoy a quiet conversation." Despite my general lack of interest in chain restaurants, Chris always rallies a defense: "It's CANADIAN! And it's only located in the Seattle metro area." And yes, that's true. Joey's only non-Canadian locations are in Bellevue, Southcenter, and Lake Union. An invasion never looked so good! With an ultra modern, yet relaxed decor, clean lines, and an attractive staff, Joey's serves up an ambiance as much as a menu and that's Chris' favorite part. Typically Joey's ends up being our destination of choice when needing to fuel-up before a mad shopping spree that inevitably involves visiting the two-story H&M, a trip to Starbucks (though, admittedly, Chris is now boycotting them), and whatever else meets with our fancy along the way. One note: when visiting on a Sunday during football season, expect to have the game playing on half the LCD TVs and a radio broadcast being piped into the dining room. This may or may not be your cup of tea. After sizing up our options for all of about a minute (we WERE starving after all), we agreed to start with the Nachos Grande. The corn tortilla chips are house-made, cut extra thick (this was arguably the best part of the nachos), and stacked about six inches high. The plate was loaded with shredded chicken, fire-roasted tomato salsa, sour cream, pickled jalapenos, sliced black olives, Monterey jack cheese, diced avocado, and refried black beans (the chicken was actually in the beans)! You can choose between mild, medium, hot, or even "hurt me hot" salsa for your largely portioned appetizer/entree. This is definitely a hearty eat, though the $12.99 feels about two dollars too much. Also, despite being stacked to the rafters, about a third of the chips underneath had no toppings and they put all the salsa on one side and beans on the other. Be sure you uncover the hidden gems before the loaded chips are gone or you'll be left snacking on them au natural. Chris typically orders the Better Beef Dip, but decided to be adventuresome and go with the Hi-Rise Burger with Cheese. The menu states this is a classic, using ground chuck, and that it's loaded with "all the groceries", which means lettuce, onion, pickle, tomato, and cheddar cheese. The large, probably third-pound burger, comes with a side of thin-cut fries and ketchup. We did lament to the waitress, twice, that they're no longer serving the shoestring fries - arguably the best we've ever had. The burger had a meaty, beefy taste to it, with no heavy seasonings so the beef could actually shine. For some reason though, about half of the burger was relatively done and the other half was very pink. The inconsistent cooking (not sure how they actually accomplished that) was barely a complaint from Chris and he said he would definitely order this again. He even had a compliment for the fries. When it came time for me to select an entree, I waffled. A lot. The "New World Cuisine" that Joey's offers means they have a little bit of everything from Thai and Chinese, to American and Mexican, plus seafood. However, I was finally able to settle on the Chicken Souvlaki. I was missing the original skinny fries, so chose a Cesar salad instead of the regular accompaniment. Also, for those of you with large appetites, take note that this entree will be on the smaller side. That said, the warmed pita is slathered with hummus, then topped with lettuce, perfectly roasted chicken, and drizzled with tzatziki. Bottom line: this sandwich is delicious, but felt overpriced given the mediocre portion. There were really only two things that kept Joey's from being 4 Stars. The first was the haphazard nachos (toppings not very evenly topped) and the second was the odd doneness for Chris' burger. Chris summed it up well when he said, "I really just like coming here for the ambiance. It's so cool!"